← What’s going on Wednesday! Revlon ColorStay Whipped has been on the market for quite sometime now. 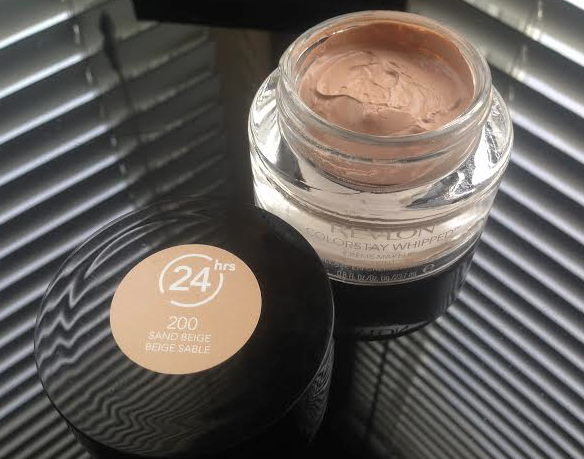 I’ve seen multiple YouTube guru’s raving about it and I was in the market for a new foundation, so I figured I would buy it for my Major Haul coming up. (I couldn’t wait to post about it, it’s not in the Major Haul anymore.) Now, I bought mine at Walgreens and it was about $15.00. I’m sure you can find it at Target or Walmart for cheaper. It’s a really decent size, and the texture is like pudding. When I first applied the foundation, I used a regular foundation brush. At first, I hated the way the foundation looked, but I continued to apply it. When I was done, I was like “DAMN! I’m flawless!” I loved it. The next day, I used my beauty blender to apply it and I loved it even more. I thought I had found a new foundation, everything was perfect, down to the color match. I was so happy! I felt great. That is until the night of the second day. I noticed I was breaking out, I thought it had to do with my diet or lack of water. Until I noticed a rash on my forehead. I was like “Oh no, this can’t be happening!” I usually have really tough skin, I rarely have problems with products. I couldn’t believe it! I immediately took off the foundation and washed my face to prevent anything from worsening. This morning the rash calmed down a bit, and I went to using L’oréal True Match Lumi. I’m honestly so bummed that Revlon ColorStay Whipped didn’t work for me. I loved everything about it! I guess I’ll have to look at the ingredients and see what caused me to react this way. So for The Modern Lady this product is a Miss, unfortunately. It would have been an amazing Hit, had it not broke me out! If you haven’t tried Revlon ColorStay Whipped, I still say give it a try because it’s seriously an amazing foundation in my opinion. If it works for you, I’m super jealous. Oh well, I’ll continue my search for a perfect foundation…. HEY! If you haven’t suggested anything I should grab for my Major Haul, DO IT! Especially foundations now! Hah! This entry was posted in Uncategorized and tagged beauty blog, beauty blogger, Blog, colorstay, comment, fashion, follow, fun, hit or miss, loreal lumi, loreal truematch, major haul, miss, not a hit, opinions, Review, revlon, revlon colorstay whipped, sadly, style, suggestions, The Modern Lady's Guide, TheModernLady, whipped. Bookmark the permalink. Have you tried L’oreal’s Lumi True Match, or their regular True Match foundation? The Lumi foundation was my favorite when my skin was going through a dry spell, but now I just use the regular. I’ve been tempted to try Maybellines mouse-like foundation (I can’t remember the name of it). I LOVE the L’oréal Lumi True Match!! I haven’t tried the regular True Match though, I might try it next. I really want to try a mousse like foundation too! Let me know if you find any good ones!! Girl! I’ve been itching to purchase so many new products lately, so my excuse is my “Major Haul” post coming up! Haha! Ha! Me too! I may have to wait until I can actually purchase anything new, sadly.